Climate change poses one of the greatest challenges for human society in the twenty-first century, yet there is a major disconnect between our actions to deal with it and the gravity of the threat it implies. In a world where the fate of countries is increasingly intertwined, how should we think about, and accordingly, how should we manage, the types of risk posed by anthropogenic climate change? range of contributors who together examine the intersection between the science, politics, economics and ethics of climate change. The book includes perspectives from some of the world's foremost commentators in their fields, ranging from leading scientists to political theorists, to high profile policymakers and practitioners. They offer a critical new approach to thinking about climate change, and help express a common desire for a more equitable society and a more sustainable way of life. Part 3: Where to from here? "Quotes from the text are certain to be hallmarks of student essays on the subject for years to come. A vital snapshot of the contemporary climate change arena." "A refreshing addition to the growing literature in several respects, most notably for its direct attention to the question of framing. This volume incorporates a range of thoughtful scientific, economic and ethical arguments plus an excellent overview." "A useful resource for understanding the complex and multi-faceted challenge." "This book, which includes contributions from prominent climate change experts from across a range of disciplines, provides insightful and innovative commentary on the nature of climate change and the future of climate change governance. The fresh perspectives offered and the extensive expertise of the contributors make this book a must-read for anyone interested in climate policy." 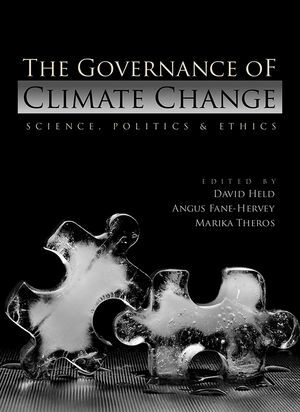 "In their book The Governance of Climate Change: Science, Politics and Ethics, David Held, Angus Hervey and Marika Theros have assembled an extraordinary panel of both insiders and analysts of the climate change regime. It is an up-to-date, very thoughtful assessment of where we are in the difficult process of global action on climate change. An excellent base for understanding why it is so difficult to agree and why we need to." An important new collection based on a series of recent Miliband lectures. Leading figures discuss the pressing issues of climate change and sustainability. This features contributions by Ulrich Beck, Onora O'Neill, Peter Singer, and Ed and David Miliband. This will be of particular interest to scholars, students and policy-makers in development studies, politics, international relations and social policy.